Doctors are seen by society as leaders and frequently take on leadership roles both at work and in the community. Nevertheless, doctors spend a large part of their careers in training as followers, accountable to a more senior doctor. Even when fully registered as consultants or general medical practitioners, doctors will not always be the leader. When acting in committees or teams they will still often be required to follow. The concept of followership has a very important part to play in the success of any group task. However, this is often forgotten. This reflects modern culture’s emphasis on leadership and its tendency to overlook the less glamorous but vital role of followership. Unfortunately advertising ascribes leadership with all the positive aspects of success and falsely depicts followers as docile and impotent. “Always be a leader, never a follower” is emblazoned on one leading cyclist’s shoes. Bill Gates may have founded and led Microsoft but could not have achieved success without the followers that worked for him. Health services around the world would not function without the support of the majority of their staff who are not in leadership positions. Followership is the response of people in subordinate positions to those in senior ones. It is a social relationship between the leader, followers and the group. It is not subservience or passive obedience to orders. Rather it is a process whereby followers engage in constructively critical thinking, and interact with and support the leader to help achieve a task. Good followers are accountable for their actions. They can also influence and mould the leader’s views. When necessary they can even substitute for the leader. Members of any team should be aware of their own and each other’s followership style as set out in Figure 1. 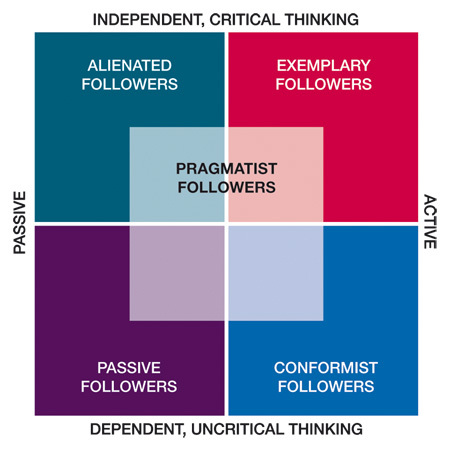 This illustrates the two dimensions that are fundamental in determining an individual’s style of followership (independent thinking and active engagement) and the five followership styles that result from them. "Good followers are accountable for their actions. They can also influence and mould the leader’s views"
Followers who are not engaged with their organisation or task and do not apply independent critical thinking are passive followers. These individuals require constant motivation and direction and, consequently, can be a drain on the leader and the team. Those that support the task and are motivated but do not critically appraise what they are doing are conformist followers. They will always support the team leader and may work hard but they do not consider alternate options and may not make decisions without guidance from the leader. Alienated followers have high levels of critical thinking but are disengaged from their organisation and task. These followers usually come across as sceptical or cynical. When the leader, or team, tries to move forward, they will voice the reasons why it shouldn’t happen. They may have good ideas but do not put these forward. Indeed, they may be negative and undermine the group. In comparison, the exemplary follower will apply constructive critical thinking and interact with the group and the leader. If they agree with the current course of action, they will back the leader 100%. Alternatively, if they disagree, they will challenge the leader, offering constructive alternatives in order to help the leader and organisation achieve their aims. Some people are pragmatists and move between the boxes in their followership style over the duration of the task. It is important when working in a group that leaders and followers do not succumb to ‘group think’. This is where the culture of the group lends itself to thinking about and analysing things in the same way. Similar views, and a desire for unanimity, lead the group to concur too easily and overlook potential problems and alternative ideas or options. "Followership styles can have an important part to play in the onset of group think within teams"
Many modern businesses appoint one or two board members from successful organisations that have a completely different field of interest to prevent group think. Many clinicians will have experienced group think in hospital practice. For example, a surgeons’ meeting on theatre policy without an anaesthetist present will be very different to a meeting with anaesthetist representation. Followership styles can have an important part to play in the onset of group think within teams. Within a group, passive followers agree and go along with the flow just because they think this is the group’s view. Conformist followers will actively support any group decision and act on it as they don’t have the independent level of thinking required to consider the options. Both these styles of followership predispose a group to group think. Alienated followers demonstrate critical thinking, crucial for the prevention of group think, but due to their lack of participation in the group they may not be listened to and this again can allow group think from the other members. In contrast, an exemplary follower will question the status quo, and critically evaluate the facts and options before making a decision. Consequently, exemplary followers provide a level of independent thinking that is crucial to preventing group think, but they also bring a high level of energy to the group so are motivated to help see the best decision made and the best job done. Good followers must have the moral courage to express concerns. They should question why and understand the reason they do things. In doing so it is important to not undermine the leader’s authority. This can mean asking the leader to step away from the group to present your views to them on a one-to-one basis. Effective followers should be able to reflect, adapt and take responsibility for their own actions. Once the follower has understood a decision and had their questions answered satisfactorily, they should back the decision of the leader or group wholeheartedly. Share the credit with the entire team. Mutual respect between leader and follower is a key prerequisite to success. There are many opportunities in clinical practice for doctors to show good followership and good leadership. A junior doctor can tactfully question his seniors as to why a decision is taken, understand it and then convey this with a sense of purpose to the nursing staff. Poor followers take negative attributes into their leadership styles. "A good leader is responsible for creating an environment conducive to an exemplary followership style"
360 degree feedbacks from juniors, nurses or administrative staff, a key aspect of doctors’ appraisal and future revalidation, will often reveal this. Exemplary followers, when leaders, are more able to appreciate the concerns of their followers and to set the tone and vision that others will follow willingly. Andrew Gibbons is a consultant in oral and maxillofacial surgery at Peterborough and Stamford Hospitals NHS Foundation Trust, UK; Danielle Bryant is a Human Performance Specialist at the Central Flying School, RAF Cranwell, UK. Kellerman B, Followership: How Followers Are Creating Change and Changing Leaders, Harvard Business School Press, 2008. Gibbons A, Bryant D, Followership: the forgotten part of doctors’ leadership, BMJ Careers, 19 Oct 2012.